← Is It Spring Break Yet? Ok, so remember that time I said I was too busy to breathe and didn’t have time to blog? Ok, I definitely wasn’t lying but I couldn’t resist sharing my new favorite thing of the week. Maybe this should be a weekly segment… Hm, I’ll put that in my good ideas folder: right next to “Vegan and Gluten-Free Soul Food Cookbook” (which is DEFINITELY an active idea- I’m mentally working out a primitive version of Southern Fried “Chicken” as we speak). Ok, enough rambling, Jessamyn! What’s my new favorite thing? Isn’t it adorable? I discovered this while having a really quick dinner at the UNCSA non-cafeteria on-campus eatery (was that descriptive enough for you?) 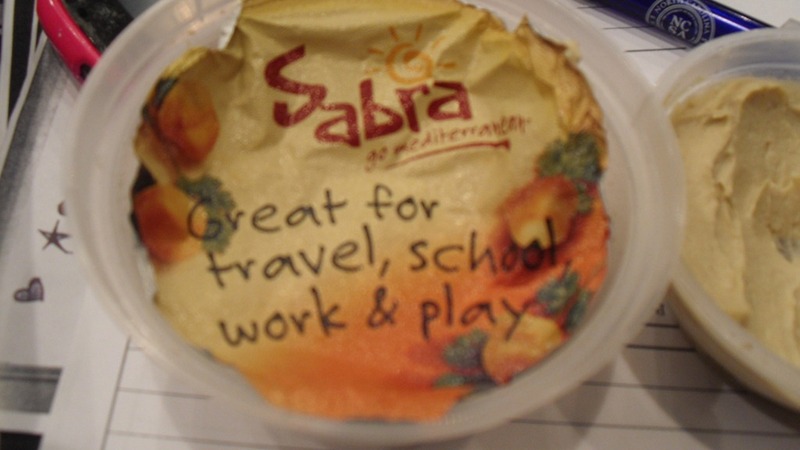 It’s a Sabra Hummus Grab N’ Go Pack. It comes in a domed container (obviously), with hummus on the bottom half and pretzel crisps on the top half. 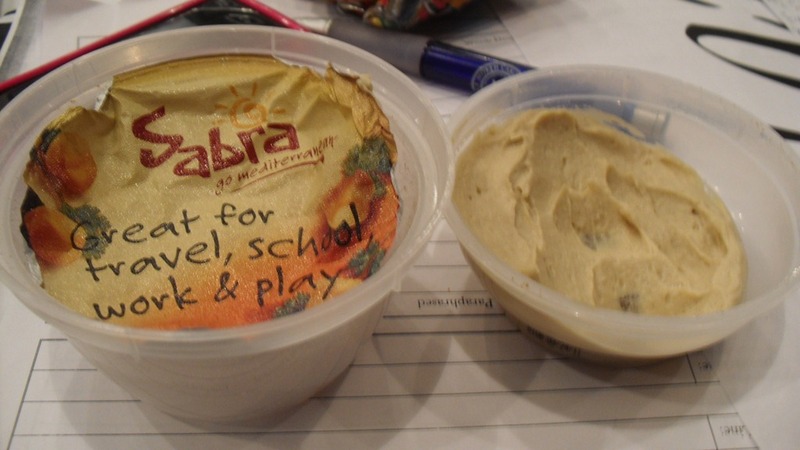 Nevermind that Sabra hummus occasionally tastes like mayonnaise (am I the only person who feels this way? I mean, I like it in general but sometimes it definitely tastes like mayo). This idea is freaking AWESOME. The container is really handy, the portion size is plentiful, and who doesn’t love pretzel crisps? Ok, I’m sure someone doesn’t. Also, I’m sure someone doesn’t care for original hummus- well, that’s why it also comes in roasted garlic and roasted red pepper, DUH! But let’s get serious: I was pleased with this purchase even though it was a bit of an impulse buy. I ate some of the pack with my fruit bowl dinner, and then decided I didn’t want anymore. 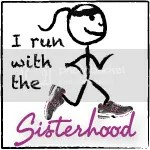 So I just put the two halves back together, tossed it in my bag, and headed back to rehearsal. Guess who had a tasty hummus mid-rehearsal snack? THIS GIRL. So yes, this pack is PERFECT for travel, school, work, and play. By the way, I’m sorry if I seem a little slaphappy and crazy: it’s because the weather here in Winston-Salem is about 73 degrees today. ON FEBRUARY 18TH. Like I said via twitter: I hate global warming as much as the next liberal, but this NC spring during winter weather? I AM IN LOVE. Happy Friday, y’all. I’m going to spend all weekend listening to hot boys sing about the revolutionary war. What are your weekend plans? Thanks for the review. I’m glad your weather is so fabulous. We woke up to now again here in Northern Idaho! Jessamyn I am lovin your voice through your pen and your blog just made my day with your handy dandy food suggestion on-the-go!! The aroma from your kitchen is delicious!! !